What are the campers looking forward to this week! We are off to a great start here at Glen Mhor and Iona! The Quest campers have embarked on a journey with the theme characters to discover a lost treasure, what will happen is uncertain but it is sure to be full of surprises at every turn! In Otter Slide the cabin theme for the week is Treasure Hunters. The Otter Slide Crew will be embarking on their own treasure hunt throughout the week and will no doubt have some adventurous tales to tell by the end of the week. Over in Sugar Bush cabin theme for the week is the life of a princess. Each day the Sugar Bush crew will be taking on the role of a different princess facing the new challenges and learning together. In Rabbit Hutch the theme is Avatar! Each day the folks in Rabbit Hutch will be conquering a new element fire, earth, air and water in order to learn new skills and take on new challenges. In Shady Oaks the theme for the week is A Trip Through Time! The Shady Oaks campers and their counsellors will be taking part in a crazy adventure where they will spend each day in a different era. Today is medieval times in Shady Oaks! Over at Iona the Go Wild campers will be working together to learn new hard and soft skills for their mid-week canoe trip as well as an Amazing Race finale on Friday! 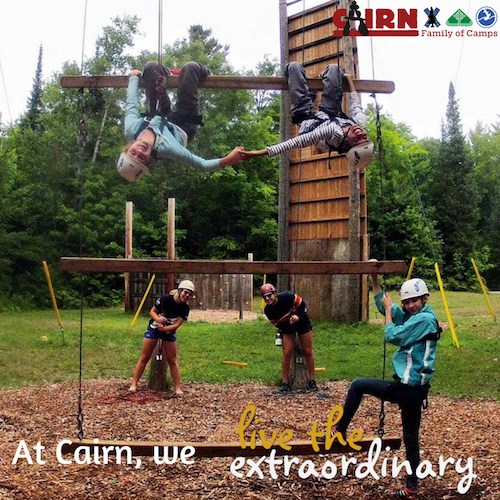 They will be completing different initiatives and tasks throughout the week to build their teamwork skills, as well as lots of fun challenges such as sword fighting on high ropes, a photo scavenger hunt, and lots and lots of swimming. The kids are super looking forward to hanging out with the chickens, causing shenanigans, canoeing a lot (or at least tipping out of boats), and doing archery! Tomorrow we are going to be preparing for our out trip and then heading out on the Muskoka on Wednesday! Stay tuned for our Wednesday post to hear what the campers enjoyed most so far!